There are also in Windows 10 a registry editor, if you for example wants to change registry entries, or edit, it is the most popular tool in Windows 10 for this task. Fortunately, the Registry Editor was not removed in Microsoft's newest Windows and can still be used for example to change system settings, that would be otherwise very difficult without changing the registry entries, for some changes on system settings you need administrative access rights. This example is also for Windows Server 2016 and 2012. 1.) ... Start the Windows 10 Registry Editor via the Win-10 Run dialog! 2.) 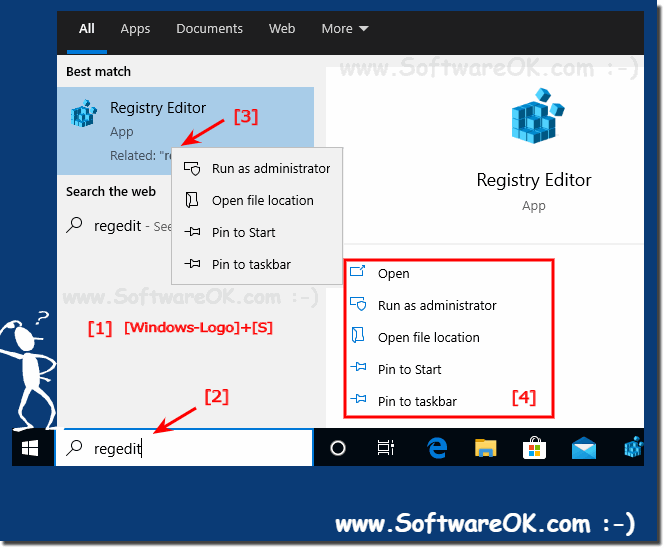 ... Open the Registry Editor from the Windows 10 search! 3.) ... The folder of the Registry Editor plus desktop shortcut! 4.) ... Print the Registry or export an import! 1.) Start the Windows 10 Registry Editor via the Win-10 Run dialog! (Image-1) Run windows-10 Registry-Editor ! Info: The System configuration information is stored centrally in a hierarchical database called the registry. 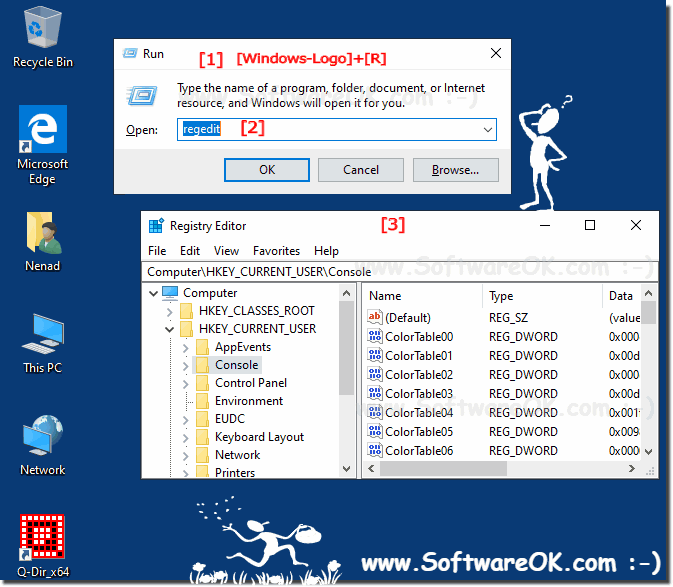 You can use regedit.exe (Registry Editor) to add, customize, change and edit registry keys and / or values, restore the registry from a backup (*.reg file) or to default values, and to import or export keys for reference or backup. For example via right click on the Registry Folder (Context Menu). 2.) Open the Registry Editor from the Windows 10 search! 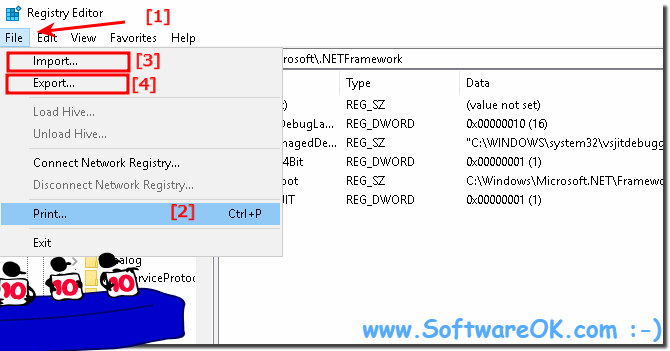 (Image-1) Start registry editor via Windows-10 search! 3.) The folder of the Registry Editor plus desktop shortcut! This solution is for all windows os! 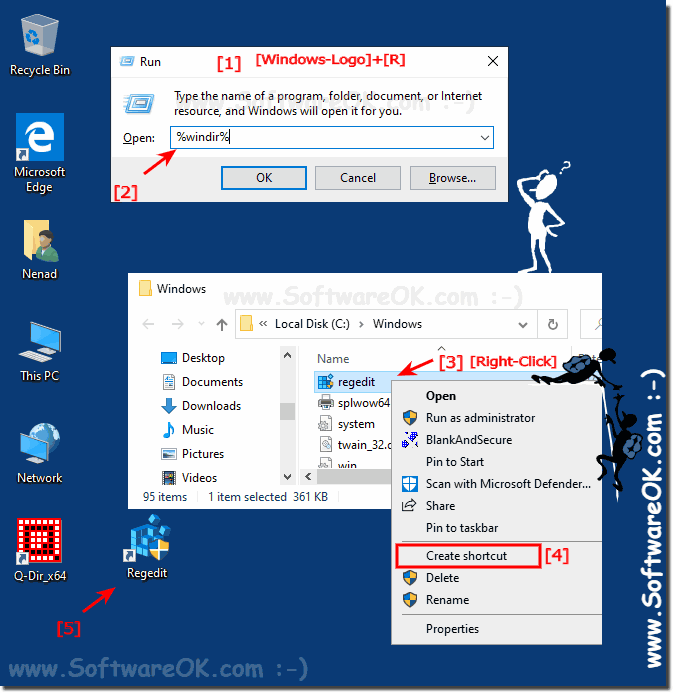 (Image-1) registry editor folder and create desktop shortcut! 4.) Print the Registry or export import! (Image-4) registry editor print, export and import keys! Bad editing and changes in the registry may severely damage your windows system. Before making changes to the registry, you should back up of data on your personal computer. If you make a mistake that results in your PC not starting properly, you can restore the registry. Windows-10 - FAQ-73: Help Windows 10 doesn't have a registry editor, where can i find regedit?